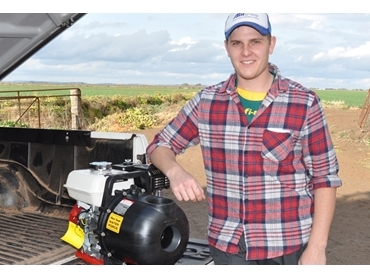 Australian Pump Industries has developed a range of poly pumps designed for safe, fast and efficient pumping of liquid fertilisers. During periods of drought, farmers have to employ better production methods to bring the soil to life including using liquid fertilisers instead of granular fertilisers to produce crops off minimal rainfall. Liquid fertilisers have been found to be up to ten times more effective than common granular fertilisers, greatly improving yields. However, liquid fertilisers are also corrosive and need to be handled with the right equipment. Aussie Pumps’ Dean Fountain explains that they have developed a new pump that is resistant to corrosion, and has the right elastomers to prevent leaks or negative chemical reactions to liquid fertilisers. Specifically developed for ag-chem applications such as liquid fertilisers, the Aussie poly pumps range includes 2” and 3” self priming centrifugal engine drive pumps, and offer advantages such as cost effectiveness, efficiency and reliability. Fountain adds that spray contractors wanting to fast refill can do so with these handy and reliable pumps. A hydraulic drive version is also available that can be plugged into the sprayer’s hydraulic system for fast fill ‘on the go’. Aussie Pumps also offers genuine Honda powered pumps with a three-year Honda engine warranty. The extra one-year warranty on Honda engines fitted to these pumps is absolutely free.